Connie Parrish Stearns brought this photo in to the Clinton County News this week as she and her two siblings born on February 5, 1949, were celebrating their 70th birthday. 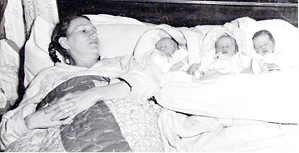 The photo shows her mother, Mrs. Robert Parrish, and her triplets, left to right, Ronnie, Donnie and Connie, shortly after their birth. The newspaper article noted that they were the first triplets that had been delivered by Dr. Sam W. Bristow, then 75, in more than 50 years of practice in Clinton and Wayne Counties. Their father, Robert Parrish, was an oil-well driller in the Aaron Community of Clinton County. Mr. and Mrs. Parrish, then 42 and 38 years of age, respectively, at the time had delivered 16 children, including a set of twins. Connie Parrish Stearns currently lives in Albany, having moved back to Clinton County a few years ago after living several years in Louisville. Donnie now lives in Georgetown, Indiana, and Ronnie lives in Myrtle Beach, South Carolina.